Looking for the best afternoon tea in London? 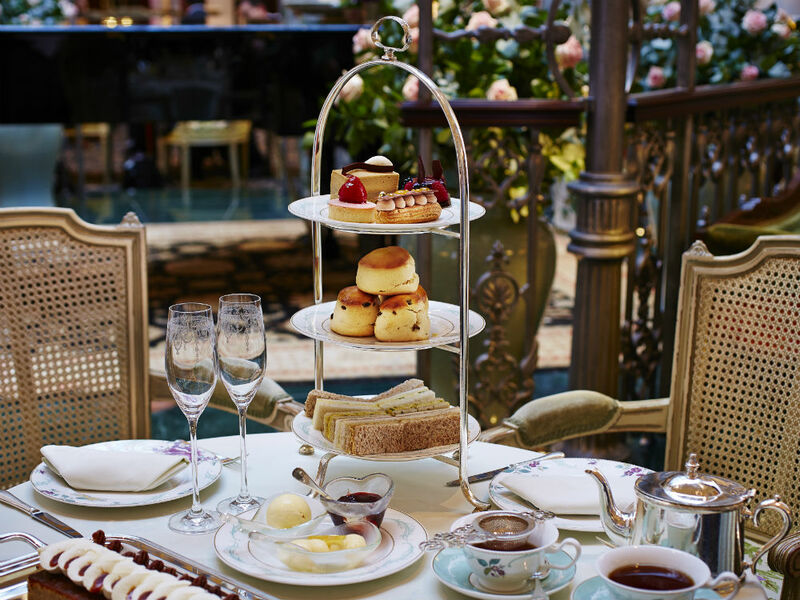 As people of Britain, it’s our God-given right to indulge our sweet tooth in lavish surroundings at least once a year as part of the sacred ritual that is High Tea. From tiny sandwiches cut into squares (never triangles – please) to cherry-topped desserts and immaculate white-gloved waiters, here are the best places to have afternoon tea in London. 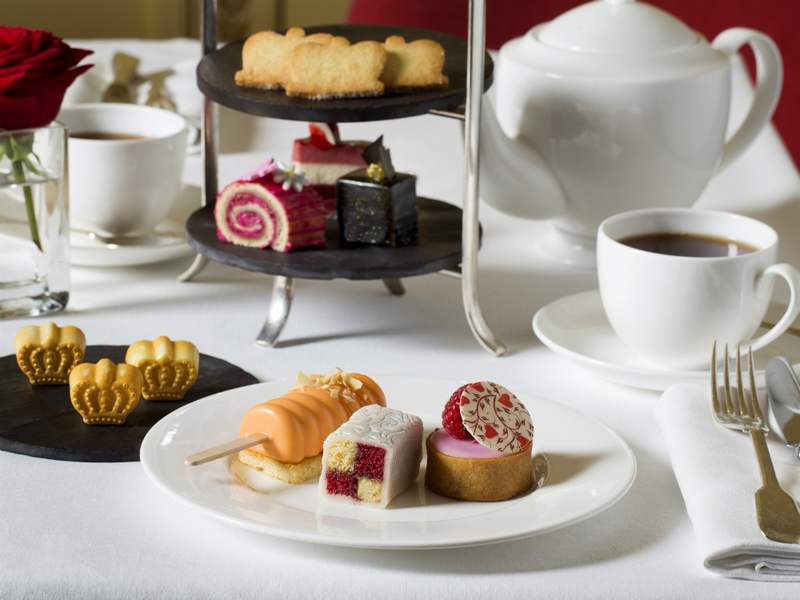 If you’re after a proper luxe, old-school-with-a-twist Afternoon Tea, then let us direct you straight to the five star Lanesborough hotel in Knightsbridge, where their award-winning afternoon tea has had a seasonally-sweet festive makeover with Head Pastry Chef, Gabriel Le Quang, re-imagining all your favourite Christmas classics. The Festive Afternoon Tea costs from £55 per person, or from £65 with a glass of Irroy Champagne (well worth it). Available until 30th December 2018. The Corinthia has always been one of our fave hotels in London, mainly due to the fact we have collectively interviewed many an A-list face within the hallowed walls of this hotel, but don’t let its starry reputation fool you, it is one of THE most welcoming hotels in the capital. Case in point, the afternoon tea – where the staff are not just well informed and friendly, but also very generous with the portions. Want more tea? No problem. Extra sandwiches? You betcha! Yes, unlike some afternoon teas where there are sandwich rations aplenty, afternoon tea at the Corinthia is a plentiful affair. Taking place in the grand Crystal Moon Lounge (! ), with a background buzz of live piano and happy patrons, you will experience the tastiest pastries and cakes and finest teas around (don’t forget to try their bespoke house infusion). Our tip? Opt in for a flute of Laurent-Perrier Champagne, because nothing is more decadent than sipping on fizz whilst eating a finger sandwich. Tucked away in a back street behind the Ritz in the heart of London’s Mayfair sits one of London’s best kept secrets: afternoon tea at the St. James’s Hotel & Club. The venue is an institution, renowned for its lush interiors and unique art collection, and is more like stepping into the dining room of a posh Georgian townhouse than a hotel, a real refuge from a day’s shopping in London’s West End. 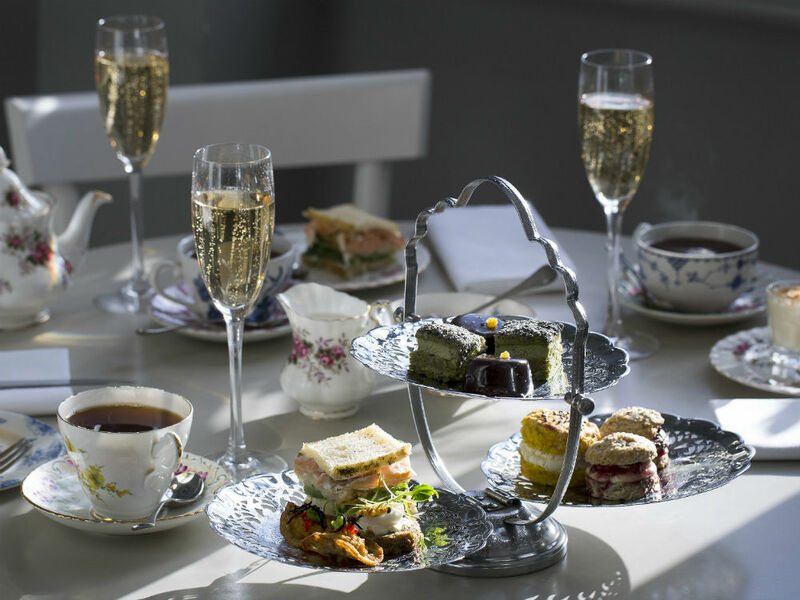 The menu includes bespoke Victorian-themed cakes, scones, sandwiches and teas inspired by the 1840s, the decade in which Afternoon Tea was born. Offerings includes St James Ham and Alberts Chutney, Ox Tongue with Mustard Butter sandwiches, home-made Cheshire Cheese Scones, and Victoria Sponge and Lemon Drizzle cakes to finish. The quality is just what you’d expect from one of Europe’s smallest Michelin-starred restaurants. Visit this Mother’s Day for a special treat. The hotel, which has partnered with the luxury pearl experts, PLAX Jewellery is offering a glass of champagne each, and a unique gift of a pair of handmade pearl earrings alongside your scones. In the heart of Knightsbridge, The Lanesborough hotel’s newly launched Alexander Hamilton Afternoon Tea is just as much of a hit as its musical namesake. Served in the Michelin-starred Céleste dining room, guests are treated to brand new pastry creations inspired by the Broadway smash and created by Head Pastry Chef Gabriel Le Quang. 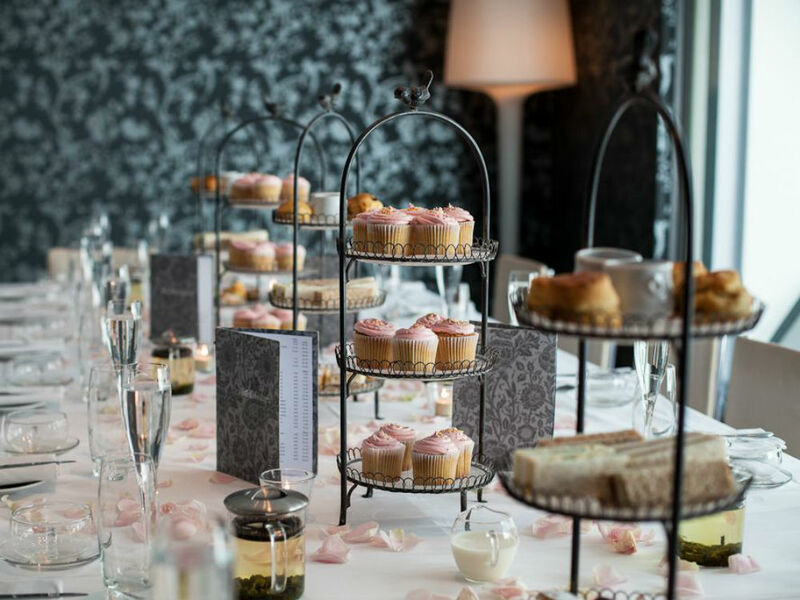 On top of these incredible pastries, get ready to enjoy scones still warm from the oven, sumptuous finger sandwiches (including the best coronation chicken you will ever taste), a huge range of teas and of course, a glass of champagne to top it all off. This tea has it all (champagne, Charleston and a bonafide jazz band). Set in the 1908 Waldorf Hilton’s airy Palm Court, dancing duo The Twin Swing will treat you to a silver-sequinned display of classic 1920s dance, accompanied by the Berkeley Square Society Band. When the girls aren’t doing their thing, the marble floor is free for the tea-takers (cue adorable older couples waltzing across the dance floor). After a tea of warm scones, finger sandwiches and delicate cakes, there is an (optional) dance lesson where you can try your luck at the Charleston (warning: you may come away with heightened sympathy for contestants on Strictly), followed by more jazz tunes. This is an afternoon excursion that will warm your heart, leaving you pleasantly full, and possibly a little breathless. Escape from Britain for a little while and head out east to Sosharu, which offers a gorgeous Japanese take on an English classic. Combining traditional Japanese desserts such as taiyaki, a fish shaped pastry filled with cream, and creating new staples such as matcha iced fingers, the entire selection stems around the ritual of tea ceremony. Of course, you can’t have afternoon tea without said drink and the tea list is long – as well as the cocktail list. 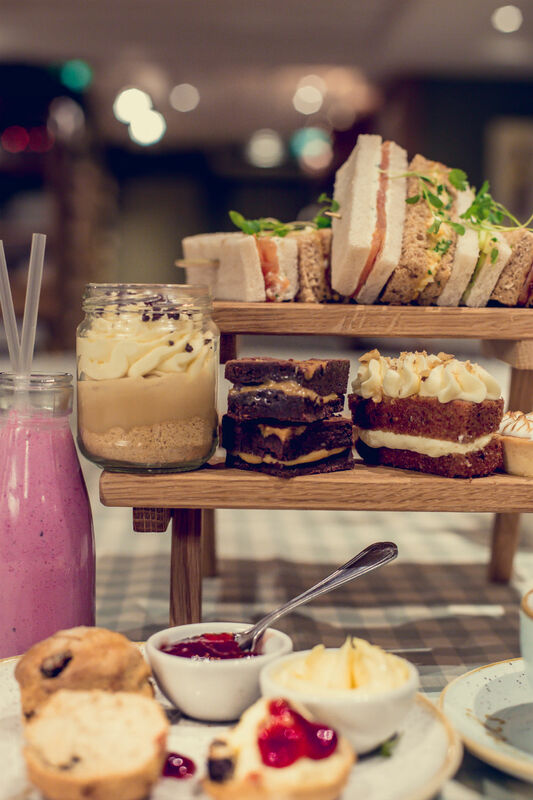 Revamped especially for the summer, the culinary team over at Strand Palace Hotel have revised their classic afternoon tea and made it a little more summer-friendly. The entire set is a stroll through a British garden, with floral touches such as white chocolate roses and milk chocolate butterflies. You can’t go wrong with the savouries either and they put a little spin on the standards – think sirloin steak and horseradish served on orange bread and smoked salmon and cream cheese on charcoal toast. Head to the Burberry flagship store on Regent Street to delight in a truly British offering at Thomas’ Cafe – primed and ready for Instagram. With all the classic staples like delicate finger sandwiches, scones and a selection of miniature desserts including lemon drizzles and apple choux buns, it’s all served on a vintage-chic brass cake stand. It also washes down a little easily with a complimentary glass of sparkling rose, which might make perusing their store slightly dangerous. Afternoon tea at The Savoy is practically an institution and their beautiful glass domed Thames Foyer is the perfect setting for it. Their multi-course treat features savoury delights such as a selection of finger sandwiches ranging from the staple egg salad to mozzarella, tomato and pesto options. It wouldn’t be a proper afternoon tea without some tea and scones, which come with a hefty helping of clotted cream, lemon curd and preserve to slather on top. Curated by their Executive Pastry Chef Ludwig Hely, there’s a delightful selection of desserts – think raspberry macarons, tiramisu eclairs and more. Take a tumble down Fitzrovia’s rabbit hole to Sanderson Hotel‘s courtyard garden, where you’ll be treated to a smorgasbord of Alice in Wonderland inspired treats, including a chessboard gateau, a chocolate and pistachio blue caterpillar, an apple, cinnamon and peach ‘Drink Me’ potion, alongside Tweedle Dee’s lemon curd financier. A guaranteed crowd-pleaser for literary fans, each addition is inspired by key characters and chapters from the Wonderland books, served with “Alice” China black tea, (or something stronger if you prefer). It looks so good that you’ll almost have trouble finishing it off (emphasis on ‘almost’). Follow the white rabbit for directions. Get inspired by 20s London with this Jazz Afternoon Tea served in the art deco surroundings of the Sheraton Grand’s Palm Court. This musically inspired tea is available for 90 days from April 30th (International Jazz Day) to celebrate the hotel’s 90th anniversary, and is accompanied by live jazz. It arrives in a bird cage – an homage to the unique structure of the 1920’s hotel. Highlights include the edible saxophone atop a chocolate tart, and the pinacolada crème topped with a musical note. There’s a veggie sandwich option too, and of course champagne and fresh fruit juice on offer. As for the tea, there are 27 flavours from which to choose – we recommend the Passion Fruit Ceylon from Sri Lanka. The great thing about this tea is it gives you harbour-side views without having to leave London. The Chelsea Harbour Hotel has partnered with Whittard of Chelsea, bringing the world-famous 130-year-old tea brand back to its roots. They offer a curated selection of traditional, herbal and speciality teas, which you can leave to brew while enjoying the repertoire of the live pianist. The scones and sandwiches are as delicious as you’d expect, but don’t forget to save space for the sweeter treats – the mini bakewell tart and red velvet cupcakes being the ones to look out for. And at just £22 per person, it’s affordable too. Go on a sunny day to get the best views over the marina. 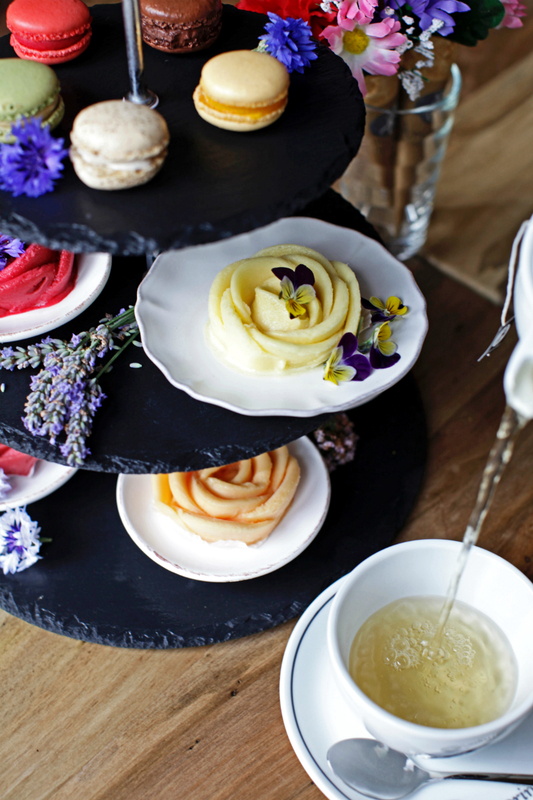 High Tea with a difference – think traditional afternoon tea but with a classic French twist. The Balcon serve traditional Dammann Frères tea (which dates back to 1692 when tea was exclusively sold in France by Monsier Damame), accompanied by a delicious array of finger sandwiches and cakes, as well as Parisienne pastries. If you wish, opt for a glass of champagne or signature cocktail – or opt for 90 minutes of free-flowing champagne for an afternoon of decadence. Taking children out for their first afternoon tea experience? The adorable children’s version comes in a paintbox with an accompanying colouring kit. Cake lovers and beauty junkies (so everyone then), this one’s for you! 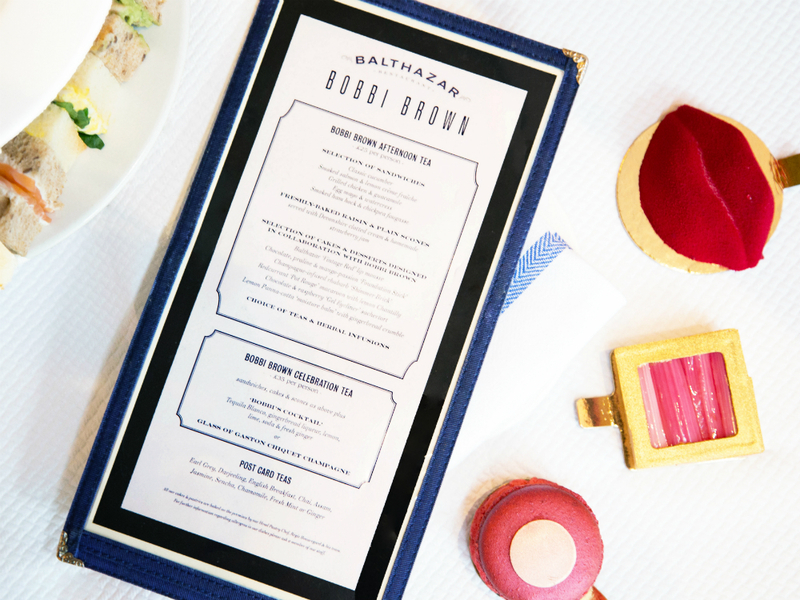 To celebrate 25 years of Bobbi Brown, the beauty brand has collaborated with Balthazar to bring you chocolate treats reminiscent of all your favourite products, alongside their traditional afternoon tea menu. Expect champagne infused Shimmer Bricks and Pot Rouge macaroons. If you’re less of a ‘chintz’ person (and you fancy a spin around Harrods afterwards) try the ultra-sleek Bulgari Hotel’s festive afternoon tea. The menu includes a nod to the hotel’s Italian roots with mini panettone, while there are other Christmassy flavours in the orange and winter spiced macaroons. If you’re feeling seriously decadent, you can even add a glass of Ruinart champagne. A quintessentially British choice. 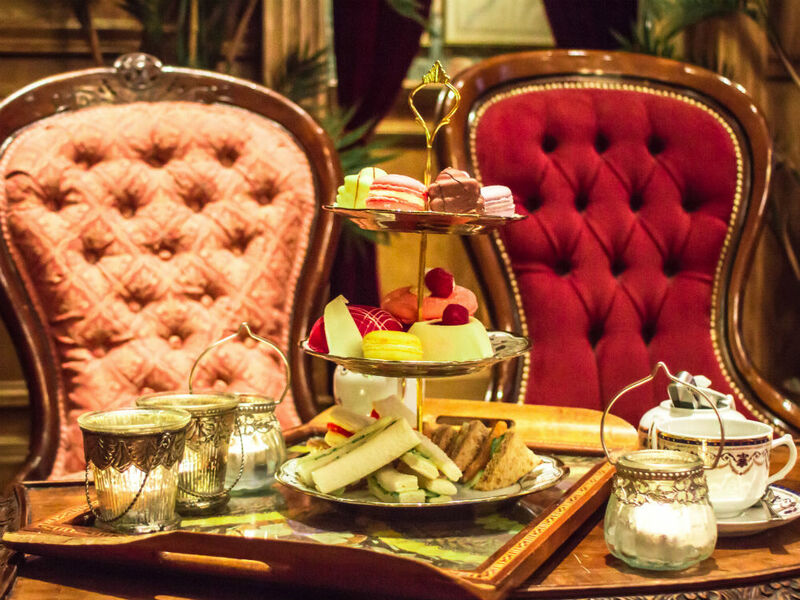 Hosted at the hotel’s Oscar Wilde bar, the Royal Tea offers an insight into the history of the tradition, followed by a London-themed menu including strawberry jam roly-poly, their Queen of Heart’s Bakewell Tart, and of course, a choice of custom-blend teas. Looking to sip on something a bit stronger than a cup of Earl Grey? Mr Fogg’s is the place. A cocktail menu, a hidden location and a new botanical garden make it a top choice for those looking to indulge their inner-glutton in style. If you’re a gin fiend, you’re in for a treat with their bottomless gin tea. Banoffee pie jars, brownie bites and little carrot loafs all accompany the usual suspects at cute Muriel’s Kitchen which is known for its healthy but hearty food. We suggest hitting the Soho branch for cake and Prosecco before heading out to the shops for a bit of tipsy retail therapy. This is one of very few vegan afternoon teas in London – at La Suite West’s Nosh Garden Kitchen the cream is coconut and the cream cheese is cashew nut. If you haven’t got on board with the whole vegan thing don’t be put off, because there’s plenty here to please. (The chocolate brownie and home-made cinnamon scones are a particular highlight). Plus, it can be enjoyed al-fresco in the hotel’s garden terrace, alongside a tea of your choice or a passion fruit and vanilla lychee mocktail (perfect if you’re trying to cut down on the booze too). If you’re looking for insta-worthy food, The Modern Pantry has got it. Sip on a flute of bubbles while munching on some classics with an innovative twist, like their roast chicken, red pepper, wild garlic pesto and sweet chilli mayo sandwiches. Been watching too many Made in Chelsea re-runs? Then get the whole thing out of your system with a calorie blow out at Bluebird Chelsea, a regular haunt of cast and a great little spot for some people watching. Located on the King’s Road, the first floor restaurant serves a Traditional Afternoon Tea with finger sandwiches, scones and lashings of clotted cream. Jolly good. Scones not your thing? Artisan gelato and sorbet specialist, Amorino are all about the ice cream. Expect gelato-filled macaroons, gelato roses, refreshing sorbetti drinks and rich Italian hot chocolate to mark the opening of their new Fulham venue. Sketch is probably the name on most people’s lips when you ask for a high tea recommendation. 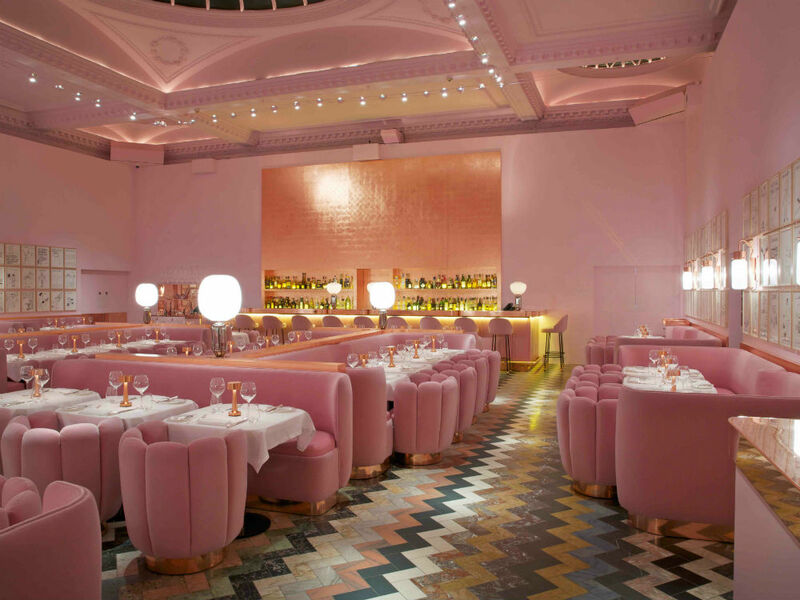 Step into the pink parlour, which is decorated by the work of David Shrigley, for an endless supply of tiny, tiny finger sandwiches and fantastical cakes. Before you leave, take a detour to the loos where you can powder your nose in a giant egg-shaped capsule. We’ll leave you with that thought. 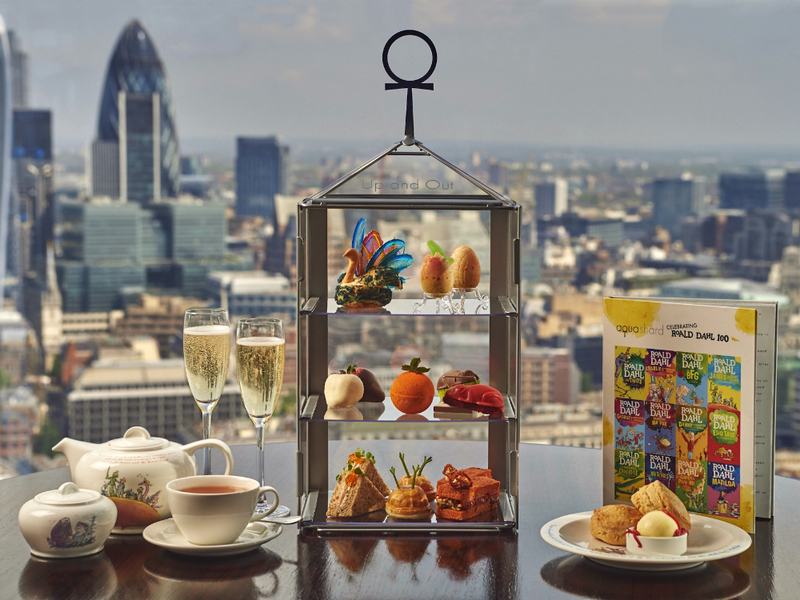 Not just a delicious menu and some of the best views in the capital, Aqua Shard also offers a glorious nostalgia trip in the form of afternoon tea. As a tribute to the iconic children’s author, Roald Dahl, you can enjoy a selection of novel delicacies from James’ giant peach (meringue) to Mr Twit’s bird pie. In case you were wondering, Snozzcumbers didn’t make the cut.